CENGN pulls in the crowd at Brookstreet with a wonderfully successful inaugural CENGN Summit! 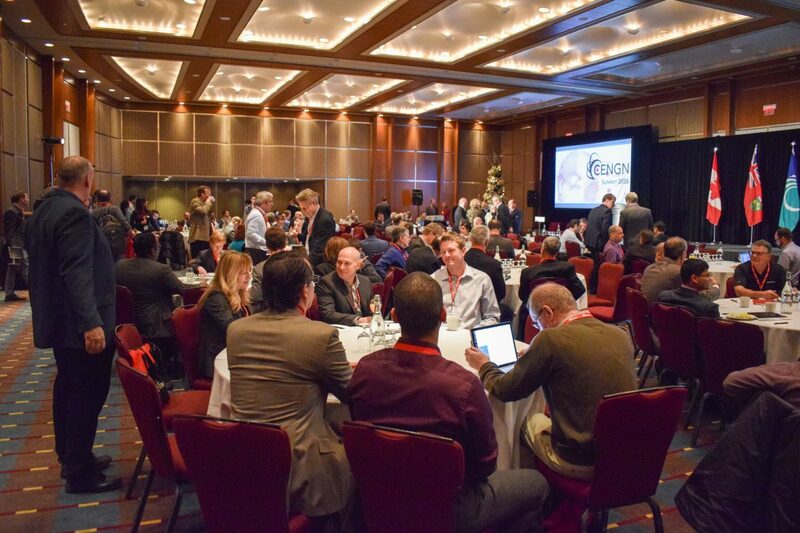 Building off the momentum of the SDN Training day and Ottawa’s Open Source Meetup, CENGN’s first annual Summit had an overwhelming amount of success! The CENGN Summit took place on December 7th at the Brookstreet Hotel with an audience that packed the room! Over 250 excited attendees, from small to large companies, academia, and government, came together to discuss the next generation of networking and the future of Smart Infrastructure! The foyer displayed interactive booths from sponsors, facilitating discussions between attendees and CENGN members and partners. Also displayed, were presentations on two of CENGN’s most high profile projects as well as a special demo from Wind River. CENGN highlighted its FastDataStacks project, in which created and implemented enhancements to OPNFV’s configurations. In addition, we showcased our Open Smart City project with partners, Juniper and Inocybe, which offered attendees a valuable demonstration about complete end-to-end smart network infrastructure. We were thrilled to see our sponsors taking advantage of opportunities to network with SME’s, government, and students, maximizing the circulation of conversation. The event opened with skillful introductions from Mayor of Ottawa, Jim Watson and Member of Parliament, Karen McCrimmon, who both did a terrific job in setting the atmosphere for the remainder of the event through experienced insight and encouragement with ICT. The CENGN Summit did a profound job on bringing together speakers from multinational organizations, and panels from SME’s, government, and academia within each region of Canada. Through their discussions came a lot of interaction with the wide array of audience members, which added a broad range of perspectives to the conversations. The Summit showcased concepts from top leaders in the industry. Their discussion topics underlined the issues in Canada’s ICT. Common themes of discussion of the event were, co-opetition, one-plus-one equaling more than 2, Canada’s leadership roles, and the transformation of all companies into tech companies. The CENGN Summit 2016 was an incredible success that couldn’t have been achieved without the help and support from our sponsors. We truly believe the CENGN summit brought together the best and brightest of the ICT community and hit home on the collaboration required in making Canada a leader in Next Generation Networking and Smart Infrastructure. On behalf of the CENGN team, thank you to everyone who attended our inaugural event and we look forward to seeing you next year!